From October 13th 1982 till Present! - From B/W to Multicolor + Photoshop touches. - Mubarak pictures is small (Size & age). 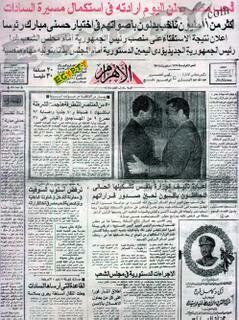 - Price of the Newspaper 20 m (Malleem). - Yes to Stability.. Yes to Democracy (sounds familiar?). - Egyptians (All) announce their support to Hosni Mubarak for President of the Republic. - 12 Million voters are going to poll satations to elect the new President of the Republic. - The election of Mubarak is the guarantee for Stability and Safety. - The operation room in the Ministry of Interior (Changed to the Presedential Committee in 2005) receives today the results of the referendum on electing the President of the Republic. - Experts of the Central Agency for forgery (couldn't find the right translation) will prepare the final results of the referendum (It was 99.999%). - We refuse the Soviet Union (reads USA in 2005) intervention in our internal affairs. - Almost the same headlines with little minor differences. - Mubarak votes in the same Heliopolis school as in 2005! 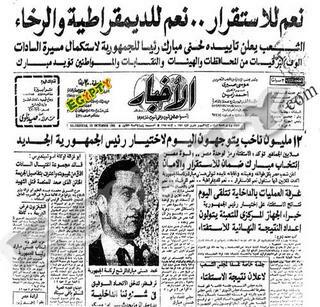 - A small box about a statement of Mubarak to Time magazine saying that the principles that Sadat laid out smoothened the transfer of power. - An editorial by Ibrahim Nafi3 (yes the same Ibrahim Nafie of Al Ahram) titled why we are choosing Hosni Mubarak!!! What a joke! 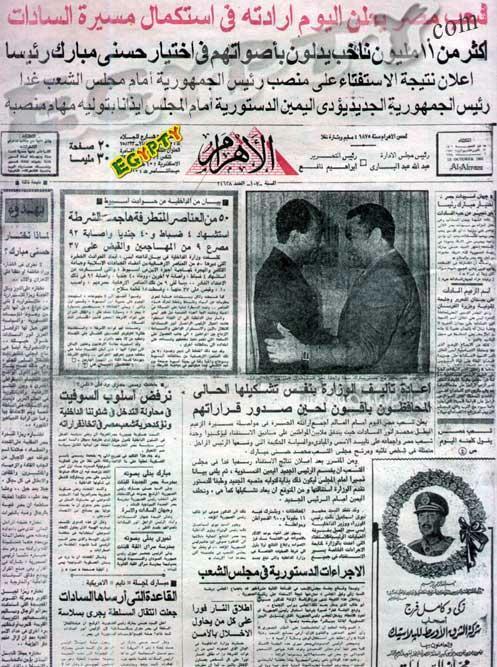 I was a bit happy with the elections untill I saw these old newspapers...They do not have much creativity?? coool post from where have you got this ? Off course no change, How is looking for change, they are looking for transmitting the power, but because of the local infleunce inside the USA that accuse Bush of double strandard with Egypt as it is lacking democracy then the play has to be played in a way that it looks like Democracy. This is the theme of our time, the core does not matter , the important thing is to make it look like it is. So , as for education, no real eduacation, we have the skeleton only but no filling, the same for health system, even the army, it is a total mess. This will not change on its owm, it needs our efforts and may be more than effort. No government at time any in the history books gave it's people wilth, the people have to create their own, egypt is poor because the pervouse regims was the only employer, you can not create wilth from nothing, egypts resources are few, we have a explosion in the population, capitalism is the answer and not the religeon. People will be free when they are rich.